It is installed in the main electrical switchboard when the building is equipped with a lightning protection system. It protects against external surges caused by lightning or utility capacitor bank switching. These devices to discharging a very high lightning current from earth to the power distribution system. Current ratings: 10Ka to 35Ka – 10/350µs wave form. Protection for : Transient Over voltages due to Switching and Indirect Lightning Stroke. Location: It is installed in the main distribution switchboard. It is designed to discharge the currents generated by indirect lightning strokes and causing induced or conducted overvoltage on the power distribution network. It protects against residual lightning energy, motor driven surges and other internally generated surges. Current ratings: 5Ka to 200 Ka – 8/20µs wave form. It is installed as a supplement to Type 2 devices and to reduce the overvoltage at the terminals of sensitive equipment. Their current discharge capacity is very limited. As a consequence they cannot be used alone. Connection of SPD in Distribution Box. Lightning protection should be installed on a overall viewpoint of Protection. For large industrial plants, data centers, hospitals, a risk assessment method must be used to guide in choosing optimal distance. In other cases like housing, offices, buildings Where there is not or less sensitive industrial risks, we may adopt following principle to select SPD.Type 2 surge protective device should be installed in the electrical installation’s incoming Main switchboard. If the distance between that surge protective device and the equipment to be protected is more than 30 meters, than additional surge protective device (Type 2 or Type 3) should be installed near the equipment. When the building is equipped with a lightning protection system, a Type 1 surge protective device must be installed at the incoming Main Switch Board. There exist surge protective devices combining Type 1 and Type 2 in the same enclosure. The Lightning rods have to be located on the highest points of the structure, taking into account the location of the grounding, and that the path of the down conductors are as short and straight as possible . Lightning is a phenomenon that generates a high frequency voltage. The length of the cables must be taken into account in cases of high frequency. The down conductors may be tapes, stranded wire or solid round. 1 meter of cable crossed by a lightning current generates an overvoltage of 1,000V. Cable cross-section of Cable (S) < 16mm² (Type 1). Cable cross-section of Cable (S) < 4mm²(Type 2). Down conductor will be placed on the outside of the structure. When it is impossible to make a down conductor on the outside, conductors can be introduced in a non-flammable insulating pipe, with a minimum section of 2000 mm2, for this purpose. The down conductors on the inside decrease the effectiveness of lightning protection, increase the risk of over voltages penetration of and difficult the verification and maintenance of installation. (1) The horizontal Projection length of the conductor exceeds its vertical projection length. (2) The height of the structure is greater than 28 meter. Equi potential bonding will be made between the conductors at ground level and every 20 meters. (1) Each lightning rod shall be grounded by two down conductor. (2) It will be necessary 4 down conductors on buildings higher than 60 meters. (3) It should be placed whenever possible in the 4 corners of the building. The down conductor routes will the shortest path, straight and direct to grounding. We should avoiding elevations above 40 cm with slope equal to or greater than 45°. The radii of curves shall not be less than 20 cm and direction changes less than 90°. The route will be chosen so as to avoid proximity to electrical conduits, telephone, data and its crossing with them. In any case, when we can not avoid an intersection conduits must be placed inside a metallic shield that extended 1 m to each side of the crossing, and the shield should bind to the down conductor. Safety distance to outdoor gas pipelines ≥ 5 m.
L = length of the down conductor from the point where it is considered the separation distance to the point where is located the nearest equipotential point. There will be 1 grounding system for each down conductor. The lightning counter must be installed over the more direct down conductor, above the joint control, and in all cases, about 2 meters above the ground. A type 2 surge protective device depends mainly on the exposure zone (moderate, medium, high). 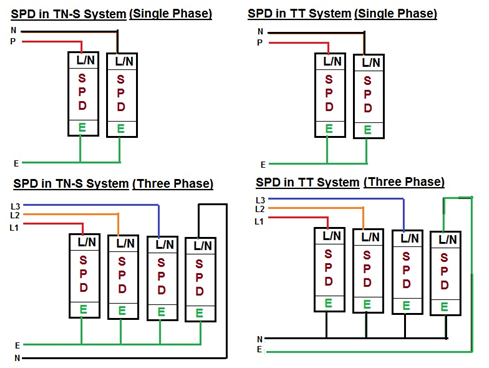 Type-2 SPD has discharge capacity (Imax) of 20 kA, 40 kA, 65 kA (8/20 µs). Type 1 SPD has minimum discharge capacity (Imax) of 12.5 kA (10/350). Higher values may be required by the risk assessment when it’s required. For high-lightning areas: SPDs with higher surge current ratings of 40 kA to 120 kA, to provide a longer service life and higher reliability.